If you want to boost your business’ online traffic volume, you need to install an analytics tool on your website. 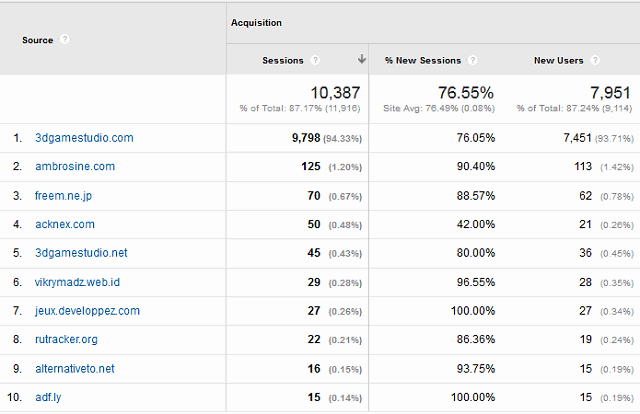 One of the best, and probably the most commonly used web traffic analytics service is Google Analytics. This guide will walk you through the three main steps of implementing and using Google Analytics: installation, reporting, and optimization. The easiest way to get access to a free Google Analytics account is to apply for a Google Gmail account, in case that you don’t have one already. Since all of Google’s services (Analytics, YouTube, Gmail, Google Plus, etc) use the same login info, it makes sense to use the same Gmail account for all of them. Then, “Sign In” using your Gmail account information. Click the account drop down menu, and then choose “Create new account”. 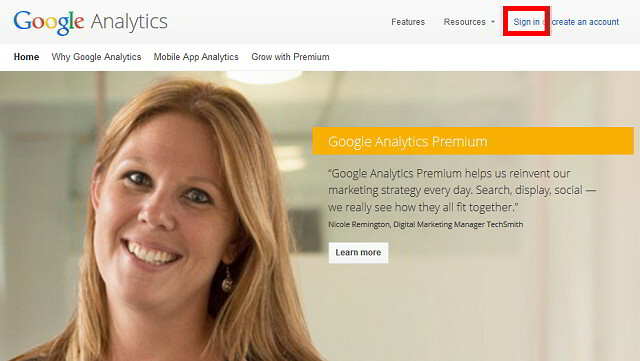 You can track a website or a mobile application using Google Analytics. Make sure to select ‘Website’ at the top of the screen; you will be taken to a form where you can enter all the needed details: account name (any relevant name), website name, website URL, industry category and time zone. Click ‘get tracking ID’ and you’ll see Google Analytics’ Terms of Service page. Accept the terms and click through; you will see the HTML code for Analytics’ tracking code. Here’s an example; don’t worry, we aren’t going to edit anything, but simply copy and paste this code into our website. 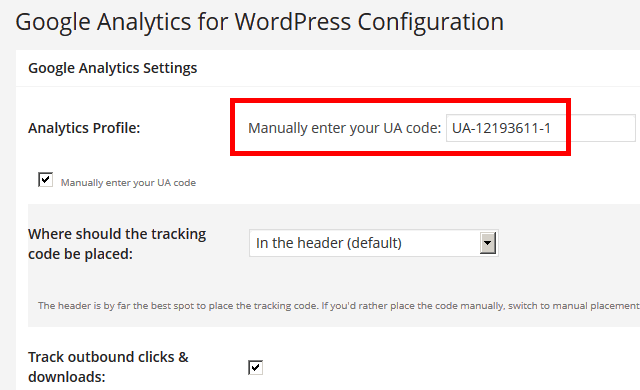 If you are using a WordPress blog for your website, you can download one of the many Google Analytics plug-ins, which enable you to copy and paste the tracking code straight into your WordPress theme. Point your browser to wordpress.org, and then do a “google analytics” search; you will discover lots of Analytics plug-ins. In fact, some of these plug-ins will make your job even easier, by only requiring your website’s unique tracking ID. 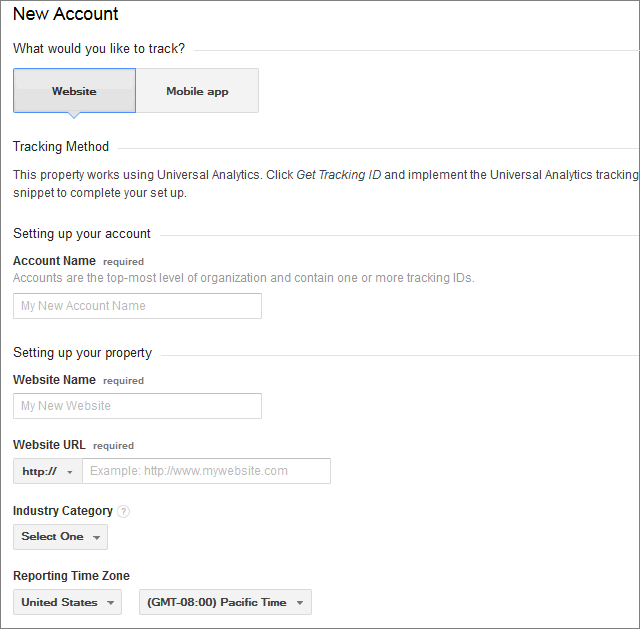 Here’s how the “Google Analytics for WordPress” plug-in looks like, for example; simply input the unique UA code that is associated with your website and that’s it! On the other hand, if you are using a static, html-based website, you will need to edit all the pages by yourself. 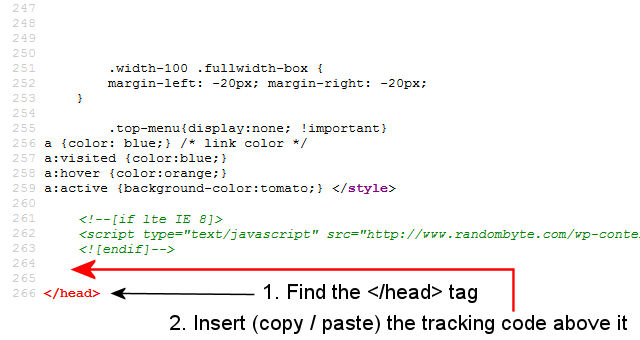 Open each page in an html editor (Google “free html editor” if you don’t have one) and then paste the tracking code in front of the closing </head> tag, like in the image below. Repeat the process for all the website pages. OK, so now we have gotten the tracking code in place. Wait a few days to collect enough relevant data, and then log into your Analytics account. You should see the Overview screen right away; click Audience -> Overview from the left side menu to open it whenever you need it. Google provides a lot of information in the Overview screen, so it is easy to feel a bit lost. Still, if you want to figure out how your website is doing, as well as get the information you need in order to optimize it, you will only have to focus on a few key metrics. Sessions – total number of visits within the selected time frame. The same visitor can make multiple visits to your site within the same day, inflating this number. Users – total number of unique visitors within the selected time frame. Your site might seem like it’s getting lots of visits, but as mentioned above, the same person can visit it more than once. 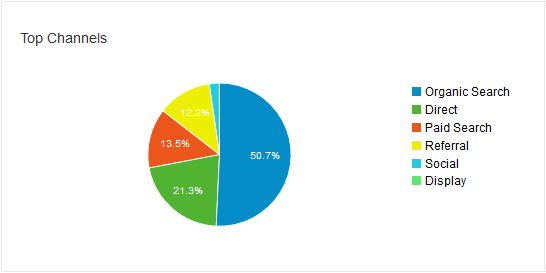 The good news is that “Users” counts the number of unique visitors to your page. You want to have as many users as possible, of course; since conversion is a numbers game, a larger number of users (website visitors) will lead to bigger sales most of the time. Pages / Session – the number of website pages read by people per visit. This number shows how appealing your site is as a whole. Do your website visitors read a single page and then go away, or do they find your website content interesting and want to read more of it? Avg. 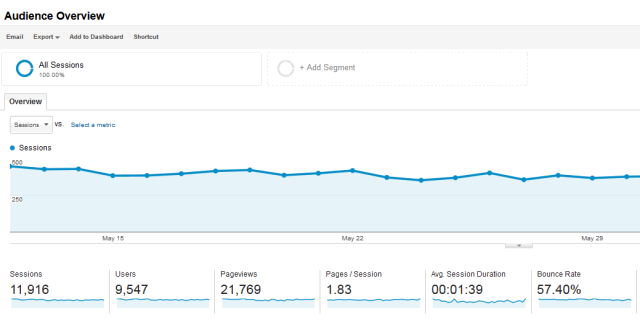 Session Duration – how long the visitors stay on your site. The longer they stay, the better, of course. Bounce Rate – the percentage of visitors that leave immediately after getting to your site, without clicking through to another page. This is also a strong ranking factor; if your website visitors land on your site, and then press the “Back” button on their browsers, Google will understand that your site doesn’t offer the proper answers to the searchers’ queries. 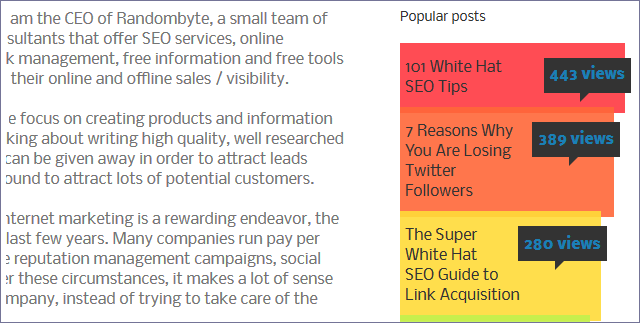 Popular Pages – the most visited pages, blog posts, etc on your website. Select Behaviour -> All Pages from the menu to get a list with your website’s most popular pages. Many websites have a few popular pages, which get the bulk of the sites’ traffic. It is very important to know which pages are the most popular, so that you can improve them, making them even better. Traffic Sources – choose Acquisition –> Overview to get access to this information. The stats show the number of visitors that arrive at your website coming from other sites, using a search engine, social networking sites like Twitter and Facebook, or simply by typing your website’s URL into a browser, or by accessing it from their browser’s bookmarks. Click each category to get more information about it; as an example, a click on the “Referral” link will display the top sites that send referral traffic to your website. Once you have access to all the information above, you are ready to start optimizing your website. I have written a detailed article on how to boost website traffic, but here are the most important Analytics-related aspects that you should work on. To boost this number, find your most popular website pages, and then link them to other related, interesting pages on your site. Just take a look at Wikipedia, for example; they interlink all their pages, so once you have landed on the site, you will always have the opportunity of clicking through to another useful page, thus increasing the number of visited pages per session. Test different calls to action; a ‘click here to read a related article’ button may not work as expected. It is best to create several articles that complement each other nicely, and then interlink them. The more pages your visitors see, the higher the likelihood they’ll buy something from you or enter their contact information into your lead generation form. Make the content on your pages longer. A well researched, meaty website page will give you the chance to insert several useful links that lead to other pages on your site. Use “Recent Posts” or “Popular Posts” widgets that stand out because of their size, colors, and so on; here’s an example. Some people split larger articles among 5…10 smaller website pages; as their website visitors click through to the next article page, the bounce rate is reduced to a minimum. Many of the big news publishers create various picture galleries consisting of dozens of interesting images, and then use clever plug-ins that make each picture view count as a website page view. Why are they doing this? Their goal main is to boost the reported number of page views, and thus be able to ask more money for their advertising space, because their websites have (supposedly) a huge number of page views. It’s not necessarily what we want to achieve, but it was a very well guarded secret (until now 😉 ) that we can learn from. When it comes to reducing the bounce rate, your main goal is to have the people view two or more of your website pages. Give them the opportunity to do that by linking to related, useful resources; show them a link to an interesting video, a free, useful report, and so on. 1. Determine your most popular pages. 2. Try to figure out why they are popular (what are they about, what problems do they solve, etc). 3. Create a few new pages that complement the existing popular pages. 4. Link to the newly created pages from your most popular pages. 5. 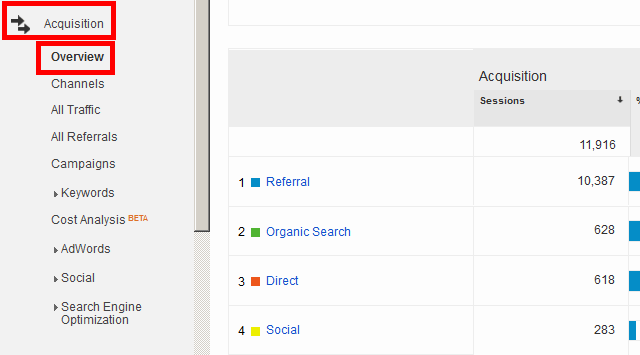 Use Google Analytics to determine if the new pages are popular as well. 6. Figure out which pages work best and improve them. Keep repeating this process and you will learn to create content that resonates with your target audience. Then, use the same techniques for all your future website pages and blog posts. Be very mindful of this mix. You don’t want to put yourself in a position where almost all of your traffic comes from a single traffic source. And you don’t want to be too dependent on a source that you can’t control. As an example, if 99% of your website traffic comes from Google, your website may take a big hit at the following algorithm update. Create a list with the top referral sites. Visit them all, and then focus your energy on the ones that send high quality, industry-related traffic. If some of these sites are forums, create accounts there and start answering questions. Place a website link in your forum signature whenever it is possible. In a nutshell, do your best to boost the flow of traffic coming from that particular source to your site. This is probably your most important goal, but often times it is simply a direct consequence of applying the tips above. Don’t forget to create and publish content on a regular basis; each one of your new website pages or blog articles will be indexed by the search engines, thus getting the chance to send you fresh website visitors. Your website may not have the ability of ranking for competitive keywords, but about 75% of the people are using long-tail searches like how can I put my website on the first page of Google. If you write an article that targets a long-tail keyword, you increase its chances of making it onto Google’s first page for that particular, long-tail search term. Use this guide to properly track your website’s visitors, figure out Google Analytics’ most significant statistics, and most of all, use these stats to improve your site’s performance. Spend time creating high quality content that complements your most popular articles, and then interlink your top pages. This will reduce the bounce rate, increasing the number of pages / visit and attracting new, targeted website visitors.